A transcript, lightly edited, of my talk at Culture • Cognition • Communication (Inter)cultural perspectives on language and the mind (ICPLM 2017), September 14-15, Lublin, Poland. My name is Andrius Kulikauskas of Vilnius Gediminas Technical University in Lithuania. I will be speaking about a question important to me, How do things come to matter? 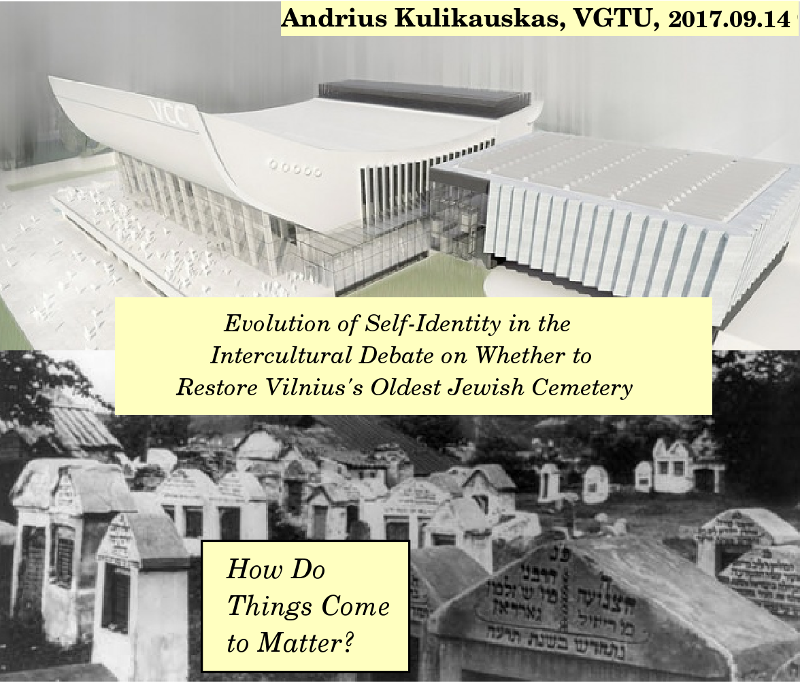 and I will relate it to the topic of Lithuanian Jewish heritage: The Evolution of Self-Identity in the Intercultural Debate on Whether to Restore Vilnius's Oldest Jewish Cemetery. So I am very grateful to the organizers and to our last speaker for having a very much related topic and I'll be focusing on my own philosophical question but as a citizen of Lithuania I am very glad to be able to think about this very concrete issue. In our case, the cemetery is from the 1500s. As you know, the Grand Duchy of Lithuania had fantastic relations with Jews up until the Holocaust when Lithuania was I think the first place where all of the Jews were killed, in our countryside in 1941 even before the Wansee conference. 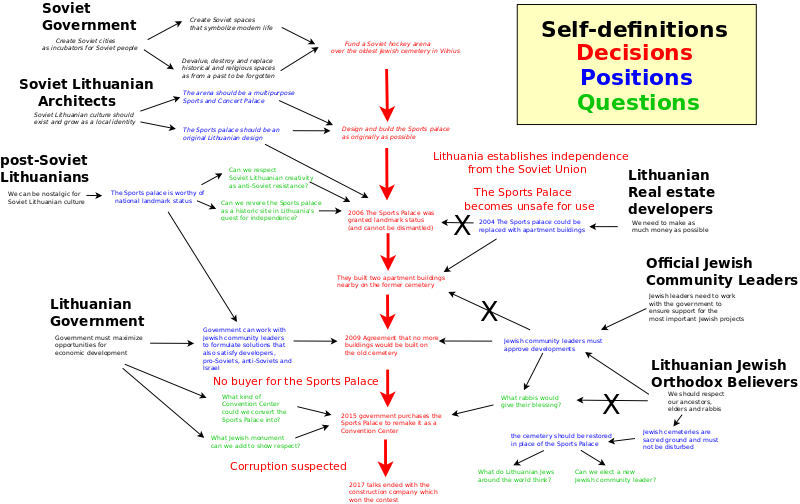 So Lithuanians have yet to appreciate the significance of those events. We have myths that the Jews wronged us somehow during the Soviet occupation. It's really a matter of shame that we were kind of friendly to the Soviets in the beginning. We also have a myth that we revenged the Jews but the truth is that it was not revenge, it was patriotism and greed. So where things stand now is that the Soviets built a Sports Palace on top of this cemetery in the 1960s and the cemetery is, like the Soviet Union, no longer usable. So it would be an opportunity to have a symbol of empathy for Lithuania's Jews that you could see from the castle of Gediminas. You could see what the Grand Dukes saw instead of what the Communist Secretary saw. But what's interesting about Lithuanians is that patriotic Lithuanians seem to have more feeling for Soviet heritage than for Lithuanian Jewish heritage. That's really quite odd. So that's the thing I'm investigating here in sympathy with our Jews. But the question How do things come to matter? is really what I'll be talking more about. And that's part of my interest in How do people behave? and How should they behave? and in particular, in this case, How does identity determine empathy? because maybe if we could change our identity than we would maybe have more feelings for Lithuanian Jews. But the things I learned, and this is very much a work-in-progress, there's a difference between static concerns and active concerns, I'll talk about that. 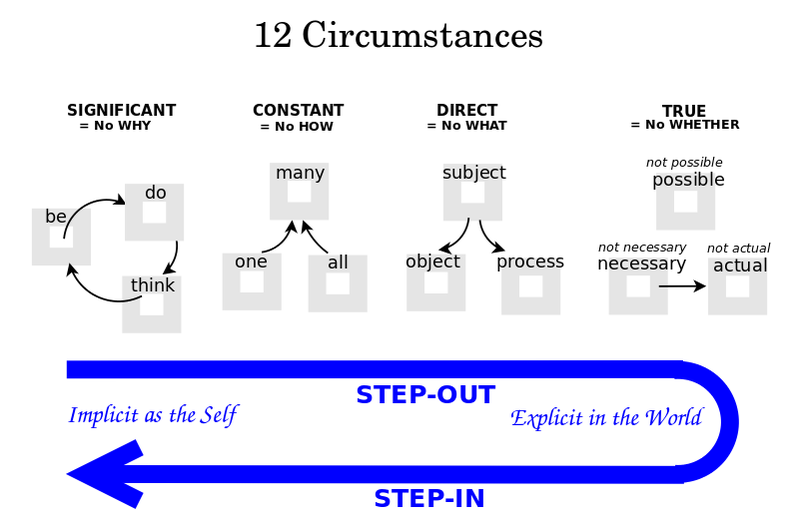 There's a difference between recurring activity and one-time activity; a difference between being stepped-in to our lives and stepped-out; and a difference between trying to have a shared identity through shared activity and just having a shared dialogue where we don't necessarily have to have the same position but we're talking about the same things. So in analyzing this I made a diagram trying to show how different identities relate. Of course, people may have more than one identity. The Soviet government was involved, of course. Soviet Lithuanian architects are involved. They ended up saying that this was an act of rebellion against Moscow, we wiped their noses showing that we can be just as good as them. We have post-Soviet Lithuanians, we have anti-Soviet Lithuanians, we have post-anti-Soviet Lithuanians, local residents. The Lithuanian government now owns the Sports Palace. We have Lithuanian real estate developers who really wanted to build apartments on it and were quite surprised that the architects were able to make it a monument of heritage and so it could not be taken down. I think that's the finger of God there. I did not put God on here but he may also have an identity. 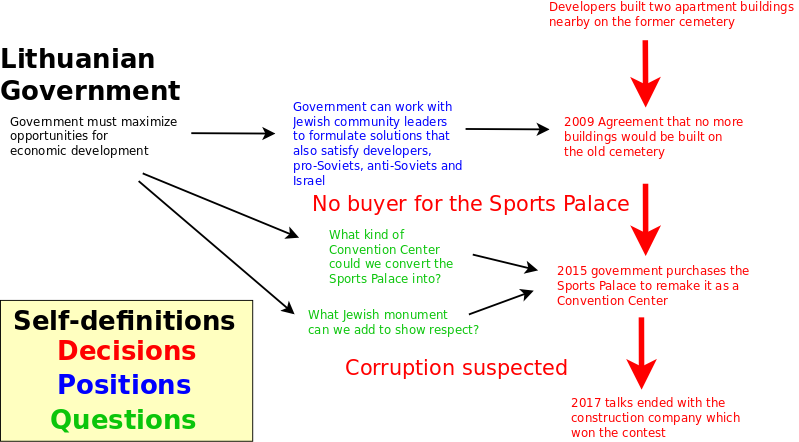 And the Jews have many different identities and in particular there is the official Jewish community which is very supportive of the Lithuanian government and tries to not cause controversy over such things, but there are religious Jews who, as we know, say that a cemetery should be a cemetery. So the Lithuanian government's plan would be to turn this into a European Union financed convention center. And so for people sympathetic with Jews who do not like the idea that Lithuanians would be jumping and dancing and urinating and celebrating on top of Jewish bodies or what was a cemetery, that's disturbing. Maybe just one detail, of course, these foundations were dug deep so underneath them there may be no bodies. Certainly around the building there are bodies. But I think the fundamental question that was brought up is that Jewish and Catholic sensitivities are different so Catholics may be interested in bodies arising from the grave but for Jews it is the cemetery that is holy. So it is the question, can we appreciate what other people think, not necessarily have the same attitude, have the same identity. 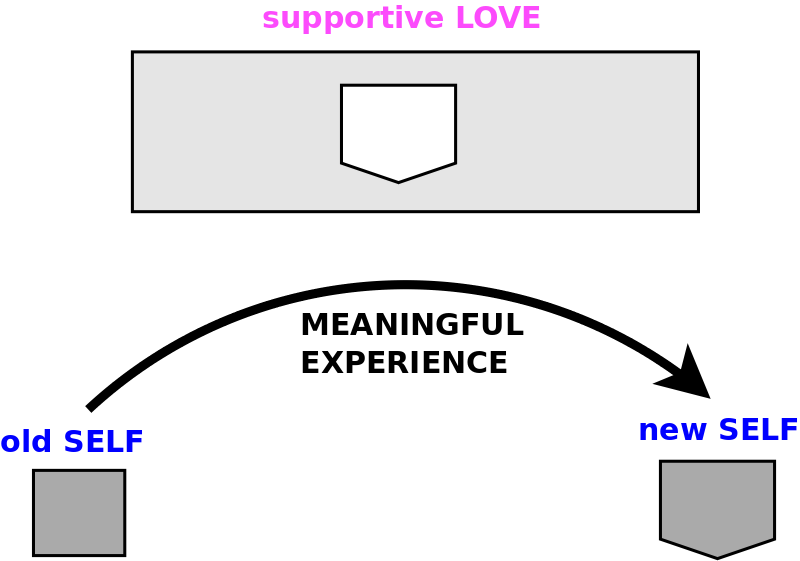 When I made this diagram I noticed it kind of fell into four different types of statements. One is self-definition. Those aren't going to change. If you're an Orthodox Jew, you're going to think like an Orthodox Jew. That's not going to change. 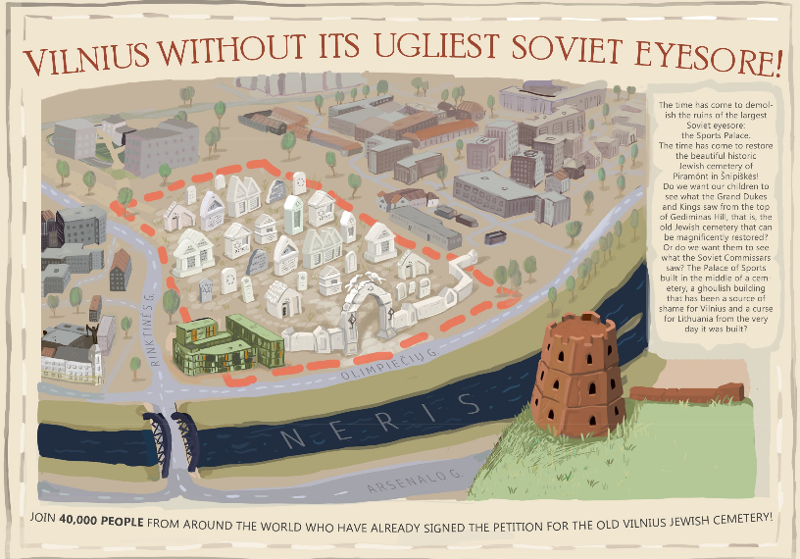 If you're an anti-Soviet Lithuanian, if you're a Soviet Lithuanian architect those things will never change. Then there are decisions made and those are hard to change. If that becomes a convention center that will stay for hundreds of years probably, that will be hard to change. And then there are positions. Those could maybe change. And then there are questions. Questions kind of invite change. So these are some practical examples... I'll just not delve into that. I want to relate this to the architect Christopher Alexander. He asked, What makes a building alive? He was in the 1970s. He is the most influential thinker as far as Silicon Valley is concerned. The very first wiki was created to talk about design patterns and actually software architects appreciated his ideas of patterns because they had million dollar software projects that would yield no results and they wanted to know how can you have projects that will be more likely to yield results? And that was architect Alexander's point also. He said, how is it that professional architects invariably build buildings that make us feel dead inside, but amateurs in the old days would build buildings that make us feel alive. He says the reason is that nowadays we build buildings from blueprints, never having been at the location perhaps, from standardized materials, we're optimizing for economic values, we're really not caring what makes this alive. But in the old days there was what he called the timeless way of building where if you would develop things solving one problem at a time using a language of patterns. So what he meant by patterns, and here's an example, you might start thinking: What's the landscape going to look like? What is the skyline going to look like? Where do we build a castle? The castle should be on a hill. There's got to be a graveyard. Of course, the graveyard is not going to be in the middle of the city but has to be somewhere to the side. Later the city grows and the site becomes good real estate. So we have this pattern. You can see the patterns kind of repeat. So the Jewish graveyard here - this is a propaganda poster in this movement - you can see that it's kind of optimized locally. It's not a grid. Things are kind of falling into place. Because you make a decision, where to build your cemetery but then you decide how to lay it out, and then you decide, oh, maybe there's a little extra here, a small space for a baby, this is a place for a rabbi. Things kind of sort themselves out as these patterns are implemented. One pattern that I'm trying to say: This could be spiritual capital. So if you're familiar in Lithuania with the Gates of Dawn where we have a holy picture of Mary or with the Hill of Crosses, this is enormous spiritual capital that you can't build very quickly. If we restore the cemetery, if it was an act of empathy, I think it could have that kind of capital. 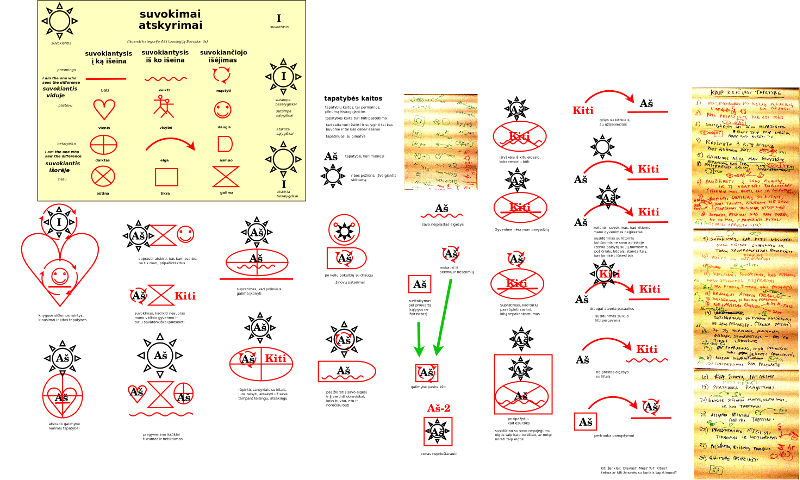 That's a pattern, a rule of thumb, if I go back to my diagram. A pattern is a very complicated notion but it is kind of what we do mean by concern. It has a structure which arises from recurring activity. So for example if you only had one death ever, then it wouldn't be a big deal but people die all the time, it's a recurring activity. People visit the dead, it's a recurring activity. So you're going to have a place for the dead, you're going to have a fence around it, you're going to have a gate which you go through. All of this happens because of recurring activity. You're going to have garbage. There will be pathways The general principle is that recurring activity evokes structure and structure channels activity. That's why from a metaphysics point of view I really like Alexander and he's the living philosopher who is most like Kant and Plato in our times, I think. But also these are rules of thumb, these are general, not specific, rules of thumb you have to optimize in location. There will be different forces which you have to optimize, and they will be optimized. You optimize then in the sense of peace. He calls it wholeness. He has different names for it, but no name is adequate, so he calls it the quality without a name. But it's really a feeling and I'll disagree with our previous speaker. Of course, if you think of emotions as words or if you think of words as trying to illustrate an emotion - then good luck. But if you try to think of what are the functional purposes of emotions, and one of the most important is peace, and I think in all languages we have peace. This is trying to maximize that. There's different challenges that this is meeting. So, for example, it should be widely applicable, a rule of thumb, but it should have a definitive solution that it's offering. It should separate forces, but it should balance them. It should allow things to be relaxed but should also be able to solve exactly. As you're deciding - this may not be the most living room - but a living room might have light from two sides, windows on two sides, and so you would optimize how big the windows should be, just standing in the room, you'd say the windows should be this big, that's how it feels. That's what gives me the most sense of peace. Now I want to explain an emotional theory which highlights the difference between the self and the world. The theory is based on expectation. It is counter to all of what psychologists of emotion are saying. Because they are saying that there is no internal experience of emotions. They are very physiological. But my theory is making some radical new claims. 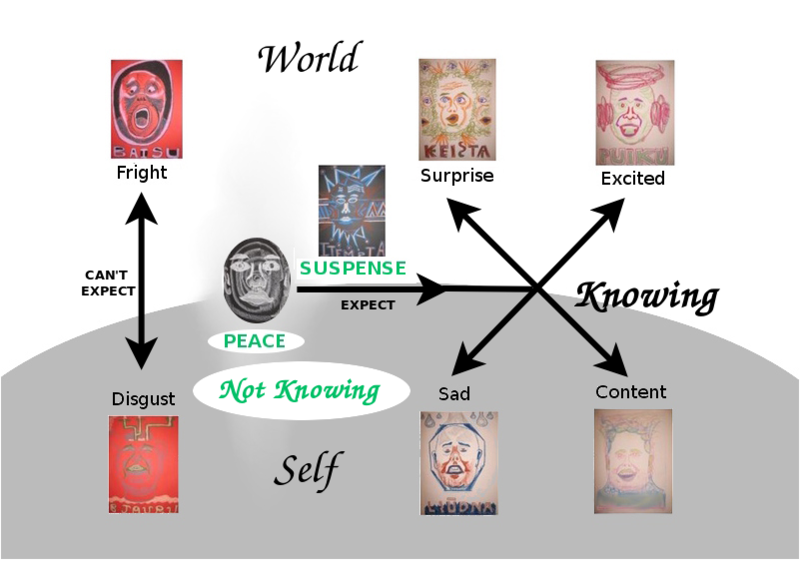 First of all, it is saying that emotions come as responses to cognitive expectation. When you're expectations are not met and it's about the world, well, you'll be surprised. But if it's about you, and your sweetheart, let's say, then you'll be distraught. It's very interesting that there's this difference between surprised and distraught which says that there's a boundary. Or feeling just excited or feeling content because everything's fine. Or instead of feeling frightened because I can't make expectations because something is happening too fast outside of me, or if something is too strange inside of me, I can't make an expectation and I feel disgust. But this boundary between self and world is very important. But these are all about knowing. We expect, we find out. Human beings are creatures of knowing. We talk about an omniscient God, all things are true of God, but what's more relevant about God is that God is an investigator. God says, hey, I don't know, let's figure out. And God's a headstrong God, and he thinks about it, it happens. He has a question and it's going. He's into not knowing, and we don't know what we're doing here in this life. Right? So we have to figure out. That's very Godly. We don't know. But we're creatures of knowing. So we live in suspense if we have expectations. But the best is if we don't have any expecations, we just live in peace, we're sensitive to all things, we lose this boundary between self and world. But by making expectations, the purpose of that is to make that boundary. It's kind of like the boundary between the conscious and the unconscious. We can't hold all of our expectations in our mind at one time. So we don't want to be conscious of them. Our emotions allow us to realize that, oh, our expectations are involved. And especially if they are from the unconscious, say, maybe I expected my grandmother to die - but my unconscious perhaps did not expect her to die, and so as a result, I may be sad that she died because I identify my grandmother with my self, and my expecatations then are dictated by my unconscious. To summarize this relationship between knowledge and not knowledge: We live this life of not knowing with God investigating through us but the way we do it is through knowledge, and we come up with this deepest value in our lives, which is especially true of mature independent thinkers because they have different values that clash. Our deepest value is like a pattern, a solution for our whole life, and it's based on where we've been. But it can't be perfect and that's the source of our freedom. The source of freedom is that we need to improve it ourselves. We're free to improve our value, so that it better helps us steer where we should be going, given that we're looking at the rear view mirror where we've been, and we're realizing that the road has turned, and our value is not perfect. So we have questions that turn us to stay on the road. If we have the freedom to improve our values, then, of course, we also have the freedom to make mistakes. 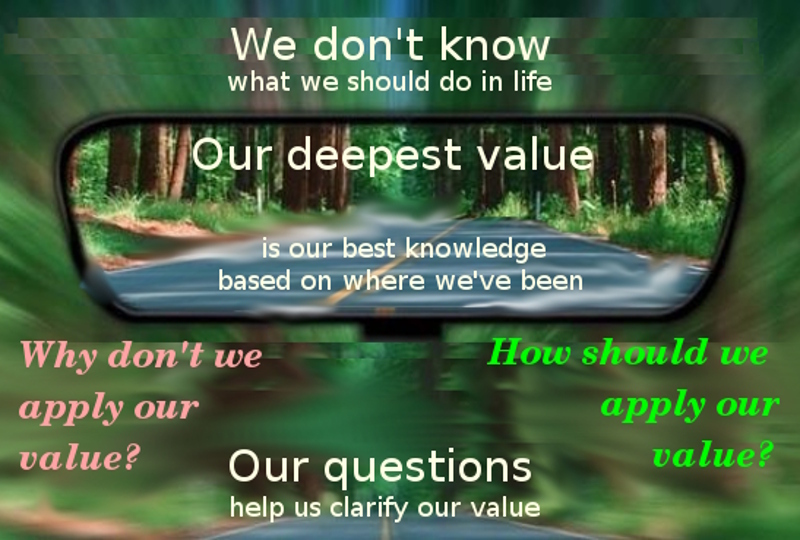 And so the questions that are very important, and these are how we care, is why don't we apply our value? and how should we apply our value? these types of questions. This brings up dynamic concern. There is one investigation that I did because I was learning to act, but I wanted it to be meaningful. This was improvisational acting in Chicago. Not just stupid, not just silly, but meaningful. I thought of meaningful experiences in my life. I made a list of 100 things that were meaningful. An example would be, when I was in fourth grade I was cursing. And I was in love with Lacie Diaz. She said, you can't curse. I said, But everybody's cursing. But she said, it doesn't suit you, and then I never cursed again. So that's an example of having an old self becoming a new self. But in order for me to do that I had to let go of my old self. I could let go of my old self because of Lacie Diaz because she was so loving, and I was so in love with her, I could let go and then I could embrace a new self. There is a kind of freedom in that, like the thing and its circumstances. That's a dynamic concern when you let go, when you have peace. When I let go of all the things that I'm attached to. When you look at such a complicated issue as the Jewish cemetery, there are so many things to be attached to. But can you just let go and try to get a sense of peace, let go of your self. That's what rationality is. Rationality is being able to think without a self. That allows something else to be a self-standing issue without me, something else to be beyond me. 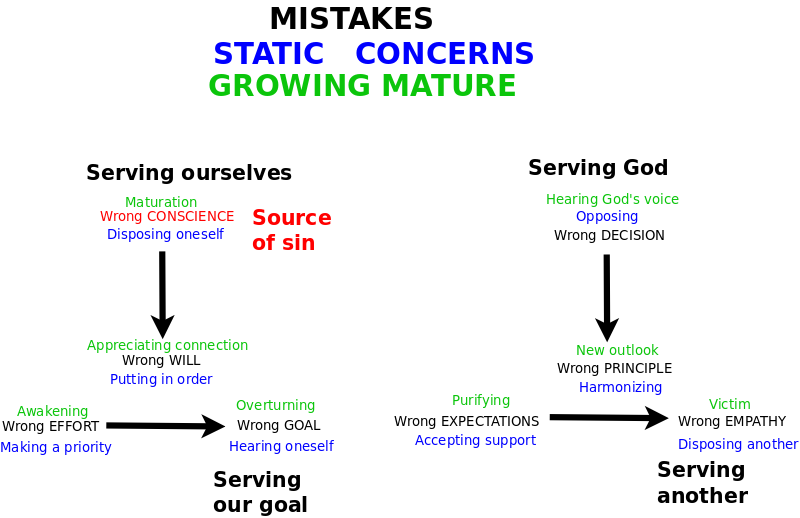 So just like God goes beyond himself into his self, he has to create his self, we're like God in conditions, so we want to climb out of that, we need to let go of that, we need to become rational and peaceful, and let other things to be, not just us. Such as those "you"s or those "third persons" discussed in a previous talk. Basically, it could be that something is or something is not, or something is desirable or something isn't, or something is impossible or not. In different ways, we'll react in different ways. The crucial thing is that things could be or not in this world of rationality but not in the world where we're our selves. In the world of our selves, it's very different, there's no question are we or are we not? We definitely are. Descartes pointed out: I think therefore I am; I am therefore I act; I act therefore I think; I think therefore I am. This is - and Kant did not believe this - an analytic aposteriori system, this is a system that we live in, but we learn from our experience. The scientific method is like that: you have a hypothesis, you do an experiment, you look at the results, you have a hypothesis - it is the engine of our soul, for participation. 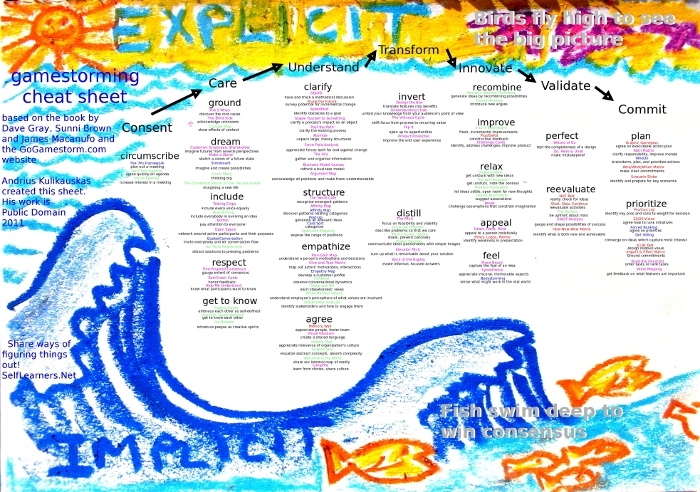 But these are not explicit systems. Rather, these are my pictures of implicit systems. 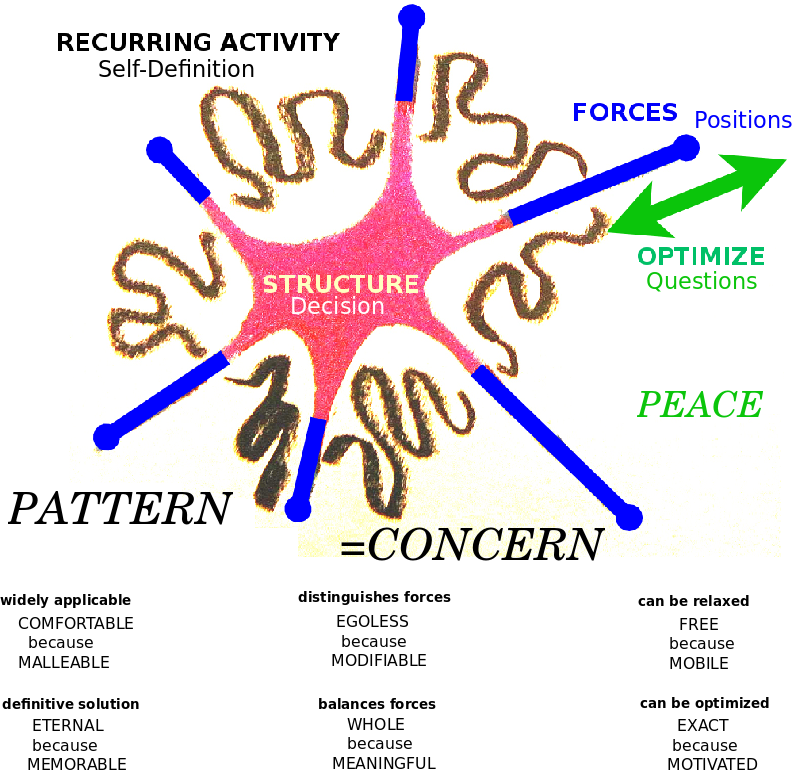 These are systems that are not axiomatic but are simply the cognitive frameworks that we live in. If you want to talk about existence, you need two perspectives. You need to be able to ask the question: maybe the chair is, maybe it isn't. You need to be able to give the answer: if it is, then it is; if it isn't, then it isn't. For knowledge you need four points of view: whether, what, how and why. These things don't change. Our life is driven forward. I can take a stand and follow through and reflect. That has different representations. These are generated not by logical forms, as Kant believed, but something very similar - mind games. I gave one mind game. These come from those four levels of knowledge, and if you negate them. If there's no Why, you can't encompass something, well, if thinking can't be encompassed, then the person who is doing the thinking can't be encompassed. If thinking is significant, then being is significant; if being is significant, then doing is significant; if doing is significant, then thinking is significant. That's a kind of hamster circle. Another game would be constancy - let's search for constancy. Either one is constant or otherwise you never find one but then everything is constantly unconstant, so all is constant. But in order to play this game with constancy, every time I take an example and then I conclude, how do I know that it stays the same? It has to be multiply constant. So I've defined one, all and many. This is cognition. I've talked about culture I'll talk about communication. These are mind games that we play. I'll just go quickly through them. If I direct my attention, then I can direct it at an object - that is something else; but then my attention can direct itself, that would be a process. But then I can choose, which is it, and that's a subject. Finally, if something is true, it means that it can't be hidden. Like a bottle can be hidden, but truth cannot. Truth is what is obvious, what you can't escape, what is in your face. What makes it obvious and what it is could be one and the same, in which case it is necessary. Or they could be different things, as when you have grounds and consequences, so that they are actually true. Or what could be obvious is the connection between the two, so that it is possibly true. The crucial thing about this is that the being-doing-thinking is when we're stepped-in to ourselves, that's like the real human mode, but there's no choice in that. The only choice there is whether you'll go ahead: put your money where your mouth is, what you believe are you going to do it? What you do, are you going to look at? What you look at, are you going to make your mind up? These things are very visceral. That's the constrained choice we have. But as we go out from ourselves, in the rational sense, things could be possible or impossible, they could be necessary or unnecessary, they could be actual or not actual. So there's this possibility to step out from ourselves, into rationality, and a possibility to step back into our selves, like with empathy. There is this difference between self and world which emotionally is very important. 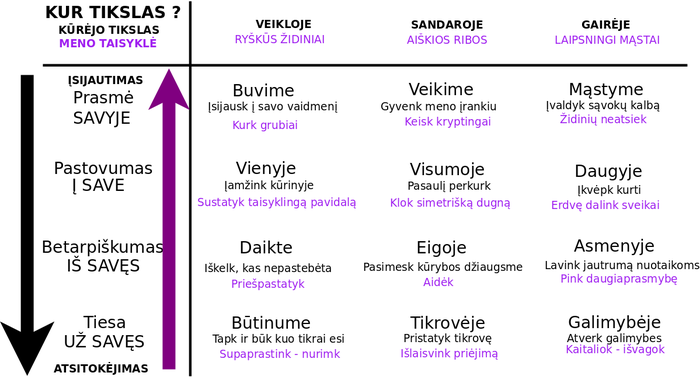 Now if I had more time to make my slides, this one is in Lithuanian, it should be in English, but basically, if you look at a question and you say, What is the purpose of art? and you find 100 purposes and you categorize them, you'll get 12 purposes of art. And these are ways of stepping-out. Then you can ask, what are the rules of art? You'll get 12 rules of art. These are what Christopher Alexander called the principles of life. And these are ways of stepping-in The crucial thing is that before you step-in as an artist, you should be coming from a state of peace. That's what's healthy. If you're not coming from a state of peace... And that's the state where what you desire is what you expect. If you start to desire what you don't expect - oh, I think that someone's going to take my bicycle, then I'm going to be angry, but otherwise I'll just feel surprised. It's very important to have healthy desires. If your desires are coming from peace, if your expectations are coming from peace, then you'll be applying all of your solutions correctly. If they are unhealthy, and you are not coming from peace, you'll be doing damage. 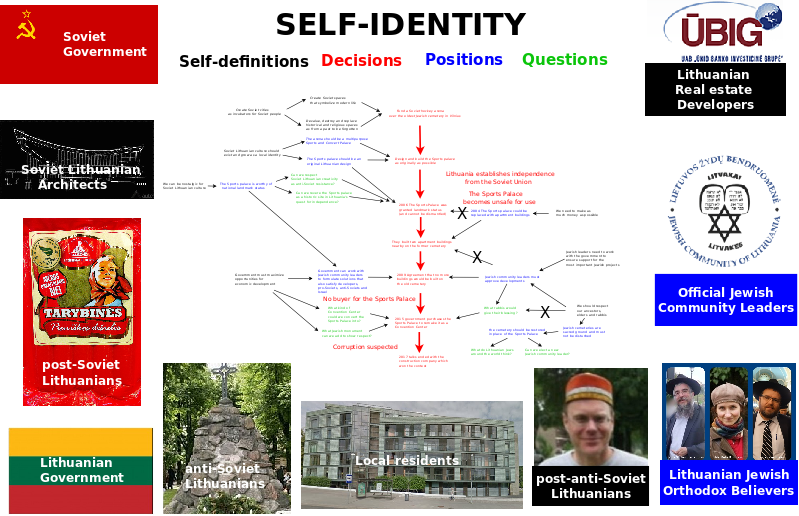 Another thing I did, I had this thesis about identity, and I thought, how does my identity change? I got my friends and we looked at different cases where our identity changed. What's very interesting is that we got these strange equations. We started drawing pictures. Identity changes when you go to another country, you do a different activity, you talk to other people, you have someone advise you. Just to make it very brief, you get these kind of funky emoticon equations but the building blocks seem to be very much these twelve circumstances. Another mistake Kant made - he called them categories as if they were things. But they are not things, they are backdrops, they are canvases in which we can imagine. Being, doing, thinking; rejecting, conditions, parallel - these are types of building blocks we have for building self-identity. 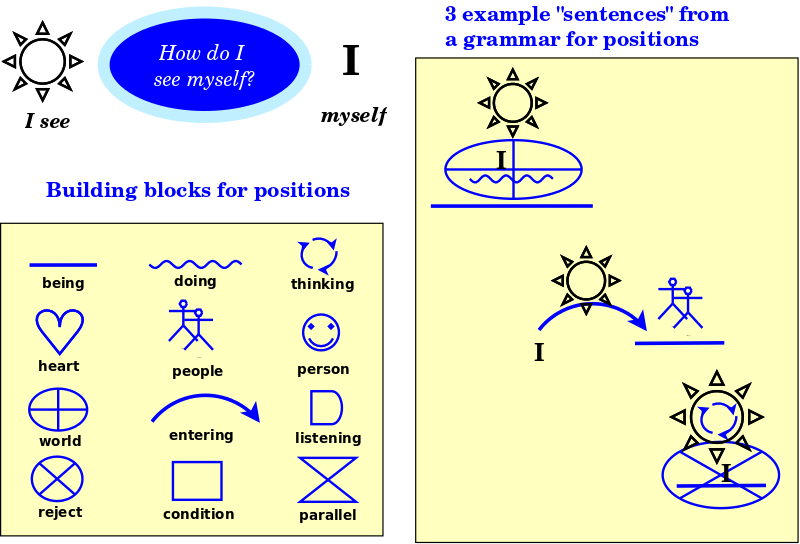 These are the building blocks that there could be for language. Here's more examples. Maybe just to say about language. What I said before is that linguists think poorly about language because they like to think very exactly in terms of assemblies of well defined words. But cognition is actually extremely vague. The way you work with cognition is that you divide everything into two parts for existence, into three parts for participation, into four parts for knowledge. When you distinguish between nouns and verbs and adjectives - that's something that you get because you divide the vagueness. And so in order to talk to people it's more about controlling the vagueness than trying to agree on what things mean. 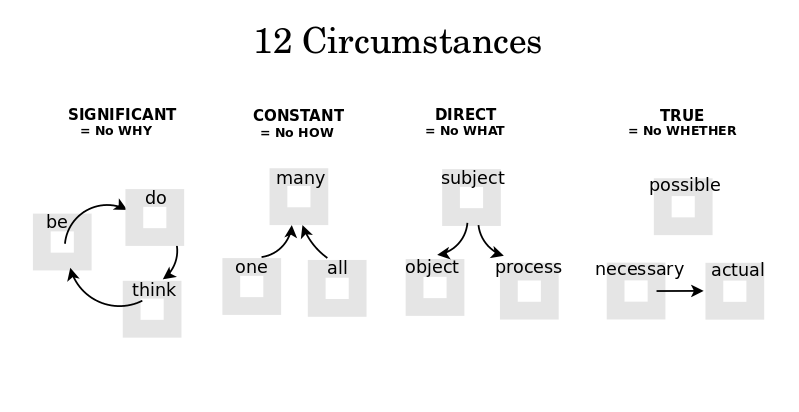 Anyways, what happens is that if we could look at static concerns, and I studied with my colleagues also concerns, what we're learning, the process is this. In a complicated case like the Jewish cemetery, you can have things that are concerns, you can have these patterns that Christopher Alexander studied, these solutions that you want to provide, but that's because you're immersed in the world. Those are static concerns. But these meaningful experiences that you can live caring about, those are dynamic concerns. You have to step-out and feel rationally, What's meaningful for me? But then you want to step back in and make an adjustment. You go from a case where you are immersed in the world, something is irritating you in the world, and then you try to rationally understand, Why is that irritating? How can I adjust it? And then you go back into the world and you say, OK, I've fixed it, I go back in and now I'm looking for the next irritation. So what does that mean about the self? We have two kinds of self. One is the self that may be Orthodox Jewish or may be very anti-Soviet Lithuanian there's a very complicated self that's in the world. But we have a more important self that says, I can let go of all of these things, I can be a pure being like God, like all of us as one, and I can just think rationally about these things. I don't have to agree with everybody, but I can take either side. And then I can immerse myself again, enrich myself in a new way with a more complicated, wholesome structure. But the focus should be on coming from peace. As Jesus said, "I lay down my life, and I pick it up again". So I am able to die and be resurrected. We live that with every decision we make. We let go and do it again. So that's the way we should be living. One thing that's a very good source for this is Gamestorming, an activity by business consultants. They have like 100 games for organizing innovation. They are part of this process where you consent, care, understand, transform, innovate, validate, commit. It's very much this same process where you're in the world and you build an agreement. "OK, let's work on it!" And the climax is that you step out and look at it from a new point of view and you make an agreement from that. And then you step in together. Sometimes you look at it from a very explicit point of view. Sometimes you look at it very much connected together from an implicit point of view. But you very much need the whole spectrum. Those are my points, just to return to them and conclude. In the world, our concerns are static, they look like these patterns, there are millions of them in terms of which we build our identity. But we always need to let go and be this thing with no patterns and be this God in peace, or this one in all of us, this spirit. The recurring activities which support all of these patterns, they're not things we really care about very much. They happen on their own. They are like that cycle of taking a stand, following through and reflecting. It's the deviations from that which can exist or not exist, can be possible or impossible, desirable or undesirable. It's the one-time activities, it's the one-time solutions that make us cool as human beings. We're stepped-in but it's really important to be able to step out into rationality. Finally, maybe the most important thing practically with regards to this cemetery. This is something that challenges what I had thought. I had wondered, How could we have a shared identity? But we don't need to have a shared identity. In the world we need to have our own separate identity which is very rich, more rich than we could possibly explain in theory, although we could model it. The crucial thing is to be able to have a shared identity rationally, to be able to say, Hey, let's let go. Let's just be rational beings. Let's let go of our identity. And that's where we have shared values. As rational beings, we're representing different conditions and we can have different positions and we don't have to agree but we just need to have dialogue. If we have dialogue, that's the kind of empathy that has value. Which basically goes back to the point that Jews and Christians don't have to agree on what a cemetery is all about. And then that's what says, Hey, maybe a Jewish cemetery isn't the same thing as a Catholic cemetery. And maybe we can show empathy.